The Fourth of July fireworks started a little earlier than usual in the State of Hockey, as the Minnesota Wild has agreed to terms with two of the most sought after free agents in the National Hockey League. The Wild has agreed to terms with Zach Parise and Ryan Suter for 13 year contracts. After seemingly endless speculation about where Parise and Suter would land this summer both 27-year-olds come to the Wild on multi-year deals. Turn off Twitter and enjoy the Fourth, Minnesota, the 2012 Parise/Suter Watch is over. Parise, a Minnesota-native, returns to the State of Hockey after playing seven seasons with the New Jersey Devils. In 502 career games, the 27-year-old has accumulated 410 points (194-216=410). He scored 30-plus goals five times, including a 45-goal year in 2008-09. That season, he was named to the NHL All-Star Second Team, played in the NHL All-Star Game and was a finalist for the Lady Byng. Serving as team captain, he led the Devils to the Stanley Cup Finals last season, but fell short to the Los Angels Kings. During the run, he racked up eight goals and seven assists. In 61 career playoff games, Parise has scored 21 goals and 22 assists. The son of former NHLer J.P. Parise, who skated with the Minnesota North Stars for parts of nine seasons, he played prep hockey at Shattuck-St. Mary's in Faribault. He then went on to attend the University of North Dakota for two seasons where he was twice nominated for the Hobey Baker Award. He also was named a First Team All-American in his second year at UND. "The opportunity to play at home meant a lot to me, and my family," Parise said. "Every kid that's growing up in Minnesota would love to play with the Wild. "Now, I'm lucky we were able to make that happen." This will not be the first time Parise and Suter have skated on the same team. In 2010, they represented the United States at the Olympics in Vancouver, B.C., leading Team USA to the Gold Medal Game against Canada. Parise’s dramatic last-minute goal sent the game into overtime against the Canadians, but the Americans were foiled in OT, taking home the Silver Medal. Skating for their country in the 2004 World Junior Championships, the duo helped the U.S. to its first Gold Medal in the tournament. "I know how great of a player Ryan is," Parise said. " To have the opportunity to play with a guy of his caliber, this is a great opportunity." Suter will become the fourth former Wisconsin Badger with the Wild next season. 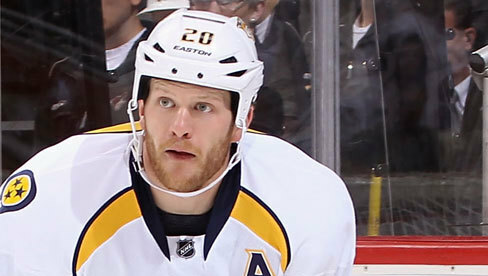 The 27-year-old has spent his entire NHL career with the Nashville Predators. Now, the UW product joins Dany Heatley, Tom Gilbert and last night’s free agent signee, Jake Dowell, as former Badgers in the Wild lineup. The seven-year NHL veteran is a blue-chip defender who would be a top-two defenseman on any team, but the Wild wins the Suter free agent sweepstakes over several other interested clubs. The Madison, Wis., native comes to the Wild after setting a career high in points in Nashville, totaling 46 (7-39=46), and was selected to play in the NHL All-Star Game. His 36 assists tied him for sixth in the league amongst defenseman. Suter is a two-way defenseman who is a world-class puck mover and thrives on the power play. His 23 points on the man advantage was good for third in the league amongst defenseman. In 542 career games in Nashville, he has racked up 238 points (38-200=238) and owns a plus-43 rating. He has piled up more than 30 points in each of his last five seasons. The Predators drafted the 6-foot-1 blueliner in the first round (7th overall) in 2003. Along with contributing in the offensive end, the blueliner is also a workhorse. He averaged 26:30 of ice time per game, ranking third in the NHL. The decision to leave didn't come easy for either player. Both are midwesterners, who have ties to Minnesota, so family played a role in switching teams. The Wild's future added to the allure of choosing Minnesota. "The fact that Minnesota has a lot of good young players, I think will help make this team successful," Suter said. Prior to turning pro, he played one season at Wisconsin and was named to the All-WCHA Third Team and the All-WCHA Rookie Team. Suter is the first free-agent defenseman to agree to terms with Minnesota this summer and, along with Parise, will join free agent signings Jake Dowell, Zenon Konopka, and Torrey Mitchell as new faces in the Wild lineup. "Ryan and I talked about this: We like what they are doing here in Minnesota," Parise said. "We like the pieces. Our hope is that we can come in and help this team get to where we want to go."